In fact, probably one of the key lessons learned from all the Atkins and South Beach hype is that #protein makes you feel full longer than carbs and fat. And, according to a recent study published in the “American Journal of Clinical Nutrition,” you don’t even have to eat low-carb to get results. In the study, the participants lost weight on a diet of 30 percent protein, 50 percent carbs and 20 percent fat. One segment of the study group was not restricted as to calories — they were able to eat whatever they wanted as long as they maintained the 30 percent protein intake. When they were switched from the weight maintenance to the unrestricted phase of the study, they spontaneously dropped their average daily caloric intake by 450 calories, resulting in an average weight loss of 11 pounds over 12 weeks. Many studies are now reporting the positive effects of protein on weight loss. In a recent review published in the “Journal of the American College of Nutrition,” Frank Hu, M.D., Ph.D., MPH, a professor of nutrition and epidemiology at Harvard University’s School of Public Health, confirmed protein’s positive effects on losing weight. “Although most of the high-protein studies have only looked at short-term weight loss, the evidence is very convincing that protein increases satiety and decreases overall caloric intake,” says Hu. First of all, foods that are high in protein slow the movement of food through the digestive tract, and slower stomach emptying means you feel full longer and get hungrier later (increasing satiety) compared with lower-protein diets. “The evidence also suggests high-protein meals lead to a reduced subsequent calorie intake,” says Hu. Protein also helps keep blood sugar stable, avoiding the quick rises that can occur when you eat carbohydrates that are rapidly digested (e.g., white bread). Also, eating foods that are low-fat, low-carb and high in protein will help you avoid other less-healthy, high-calorie foods that do not keep you full. Lastly, the body uses more calories to digest protein than it does to burn fat or carbohydrates. “There is convincing evidence that a higher protein intake increases thermogenesis [generation of heat within the body, which increases caloric burn],” says Hu. He believes you could burn an additional 30 calories per day simply by eating a diet composed of about 30 percent protein. The idea is to eat small to moderate amounts of healthy fats (e.g., vegetable oils, nuts and avocado), a moderate amount of “good” carbohydrates (i.e., fruits, vegetables and whole grains, which are also high in fiber) and a moderate amount of protein that’s low in fat (e.g., fish, egg whites, skinless chicken and turkey breast, beans and soybeans, low-fat dairy products). The breakdown should be 25–30 percent protein, 45–50 percent carbs and about 20 percent fat. Do not confuse this type of diet with a low-carbohydrate diet like Atkins or South Beach, emphasizes Hu. Also, Weigle recommends getting a good portion of your protein from low-fat dairy sources to ensure adequate calcium intake (to avoid the reduction in calcium levels that typically occurs on a higher-protein diet). Keep in mind that one of the reasons to maintain a low-fat diet is that fat is more expensive in terms of calories. Fat contains more than twice the calories of an equal amount of carbohydrates or protein. There are some potential health problems associated with increased protein consumption, such as the depletion of calcium mentioned above. However, the Institute of Medicine has concluded that there is no clear evidence that a high protein intake increases the risk of kidney stones, osteoporosis, cancer or cardiovascular disease. Currently, the IOM recommends that 10 to 35 percent of calories in an adult’s diet come from protein. Remove the skin, either before or after cooking, to reduce the fat content by almost half. Leaving the skin on during cooking will keep the meat juicier. But keep in mind that if you remove the skin after cooking, the fat underneath will have melted, and some will have been absorbed into the meat — which is also why it is juicier. 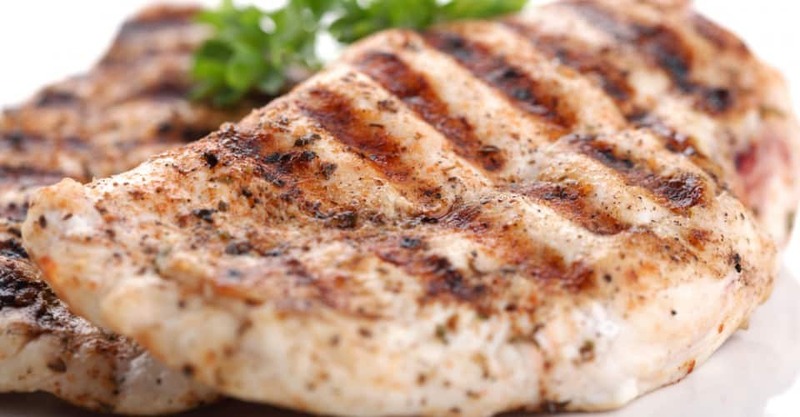 Trim all excess fat from poultry before cooking. Rather than using fat such as butter and oil to enhance poultry’s flavor, try flavored vinegars, wines, herbs, spices or citrus fruit. Cook poultry without added fats by baking, roasting, broiling, grilling or poaching. Stir-fry in olive or canola oil, or better yet, use cooking spray. Avoid duck, which is very fatty. The leanest beef cuts include round steaks and roasts (eye round, top round, bottom round, round tip), top loin, top sirloin and chuck shoulder and arm roasts. The leanest pork choices include pork loin, tenderloin, center loin and ham. Choose extra-lean ground beef. Look for at least 90 percent lean. You may even be able to find ground beef that is 93 percent or 95 percent lean. Choose lean roast beef, ham or low-fat luncheon meats for sandwiches instead of luncheon meats with more fat, such as regular bologna or salami. Avoid meat that is heavily marbled, that is, streaked with fat. Look for meat with the least amount of visible fat. Broil, grill, roast, poach or boil meat instead of frying. Drain any fat that appears during cooking. Skip or limit the breading — it adds fat and calories, especially since it causes meat to soak up more fat during frying. Dairy: Dairy is a great source of protein and calcium, and it’s particularly important to replace potential lost calcium from eating higher amounts of protein. However it is full of fat, so always choose low-fat or nonfat milk, yogurt and cheese. Egg Whites: Egg whites are virtually fat-free, but some people don’t like the idea of eating eggs without the yolks. So start off by combining one-third egg whites with two-thirds whole eggs, and then gradually reduce the amount of whole eggs. You can do the same with other foods, such as whole milk and skim milk or low-calorie, whole-grain cereal and regular cereal. Eventually you’ll get used to the healthier option. Other Protein Sources: Nuts, seeds, beans, soybeans and legumes. Make sure to limit portion sizes, especially of nuts and seeds. They’re super-healthy, but very high in fat (even though it’s good fat). Prepare beans and legumes without added fats.